Stanhopea orchids are unusual in having flower stems that grow downward through the potting medium, and will then emerge from the bottom of a basket or net pot. (Occasionally, as in the photo above, they merely grow over the edge of the basket, but this can't be relied on.) You can make your own baskets if you're handy, otherwise buy commercially-made teak baskets or net pots. The flowers are very unusual and fragrant. 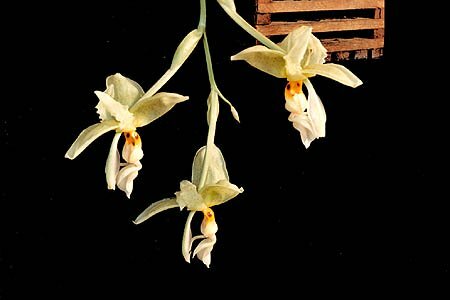 They are pollinated by male euglossine bees, which collect the flowers' fragrance to entice females. Most species attract only a single type of pollinator. The flowers are very complex and attractive in appearance, but typically last only a few days. They like to be kept moist, so water frequently, such as daily. I suggest a potting mix of sphagnum moss, fine bark, and maybe some rockwool, coconut fiber, or osmunda. Don't let them dry out too much. The extra airflow through the basket helps prevent the roots from suffocating, but overwatering is still possible if you water a LOT. Bright light is good, about 3000 footcandles, similar to lighting for a Cattleya orchid. Direct sun is too much, though. Intermediate temperatures work well; try for the lower 70's Fahrenheit (21-25C) during the day, 10-15 degrees cooler at night (6-8C). Try for about 70% humidity. They like it to be at least 50%.